Longtime readers of this site along with anyone who has known me for like, five minutes knows that one of my most enjoyable activities is cooking. Additionally, finding ways to cook with beer is another interest of mine, although I should say that beyond an excellent cake recipe, a weiss pizza crust, BBQ sauce, and a lovely sauce for some sausages, I’ve been left stumped. 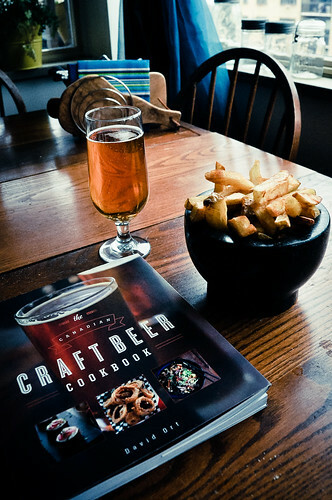 Although there have been recipes and even books that involve incorporating beer in to the dish, I’ll be honest, guys…it’s easy to get cynical when I hear about someone releasing a beer cookbook. Normally it means that the recipes have beer thrown in with very little thought, the beers suggested are very specific ones which makes the book redundant in six months to a year from publishing date, the author’s tone suggests that (bless their heart) they don’t know a damn thing about beer, or, if it’s REALLY bad, a combination of all three of those things. We’ve all bought cookbooks before, or visited a recipe blog and were disappointed. We’ve all been hurt before. But The Canadian Craft Beer Cookbook is none of those things. For five years David Ort has been a food and drink writer on his blog, Food With Legs, and throughout that time he has been creating recipes, attending events, and doing research. This book, the product of many long hours of tweaking, testing, researching, and redoing for the self-taught cook, shows the careful effort that was put in to it. 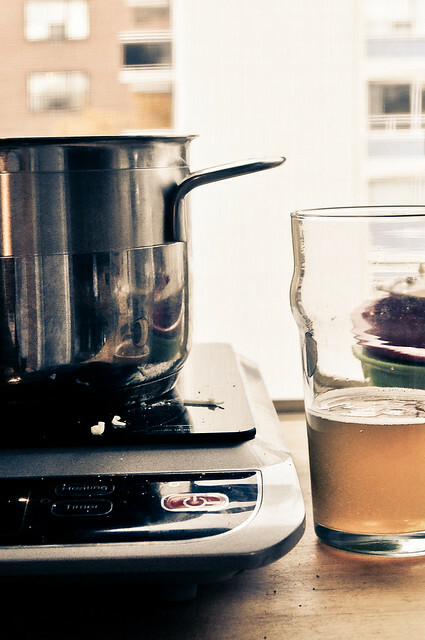 The first thing that sticks out about each recipe is the accompanying beer recommendation. Although not every recipe is actually made with beer, every recipe does have a suggested pairing in order of style, specific Canadian beer, and sometimes a specific international beer. This not only gives you an ideal pairing for the meal, but, when referring to the specific style, ensures that I can still pick this book up after ten years and make something from it. Another thing that sticks out for me is something that many would probably be surprised to learn – it’s not all pub food. While there are recipes for onion rings, Currywurst and Steak & Ale Pie, there are also recipes for Soba Salad, Fondue, and Rogan Josh as well as recipes for condiments such as IPA Mustard, homemade vinegar, and Hop infused Salt. The recipes I’ve been reading so far seem to range from “simple” to “a little more difficult but still simple” and the variety of foods ensures that one won’t be reaching for this book just for a main dish. It’s also enflaming an adventurous, experimental spirit in me cooking-wise, I have to admit. 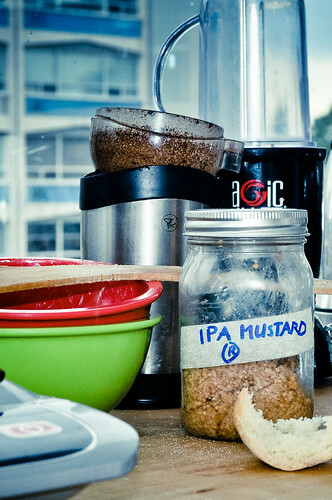 I don’t even have my physical copy yet (I was graciously given a pdf to help me with this review) and as I type this I have some mustard seeds sitting in a jar of IPA where, for the first time, I’m going to be making my own mustard (though due to availability, I had to change the suggested beer of Amsterdam’s Boneshaker to Muskoka’s Mad Tom). Hop salt and Edamame will soon be following in the next couple of days. To top it all off, its introduction section provides a very thorough history and guide to Craft Beer and the book is scattered with profiles of some of Canada’s Beer trailblazers. Ort’s thought process in forming the recipes is also brought out in an understandable way, helping the reader learn more about what it’s like cooking with the beverage from a practical viewpoint. In summary…buy this freakin’ book. There are others out there, but this one is the one I’m excited about because it is just so solid and ridiculously good. Simple recipes for big dishes that get you to think more about the individual ingredients as well as the incredible versatility of beer. Aside from what is already turning out for me as a book that I find myself going through for the next culinary adventure, it is also very obviously a love letter to good food, good beer and the country that provides both of those things. 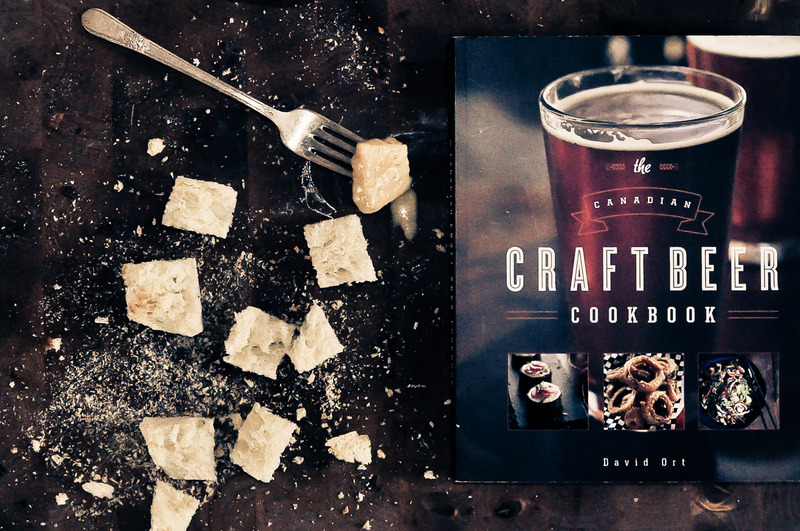 David Ort’s Canadian Craft Beer Cookbook is available RIGHT NOW in Canada and the US both online and in stores, with plans to move things more across the pond to be available internationally. When I visited David at his apartment a couple of days ago he made me a couple of dishes from the book. One in particular, an amazing fondue sauce, got devoured quickly. Tangy, sharp, smooth, slight burn (both literally from the temperature as well as from the little bit of brandy and mustard) and…argh. Just go and make it. Absolutely delicious. Toss the two cheeses and cornstarch together in a medium mixing bowl. Set a fondue pot over medium heat and add the garlic cloves and beer. 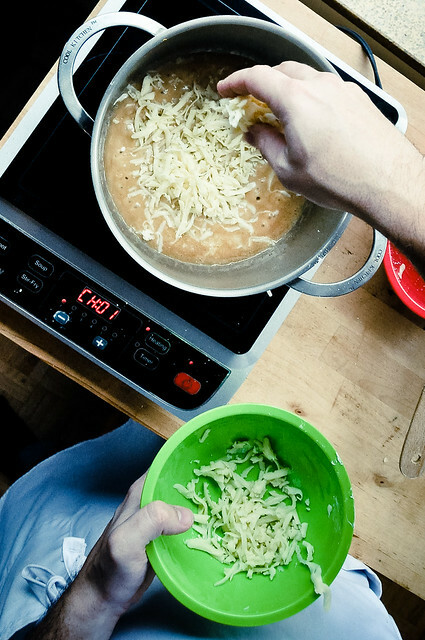 When the beer barely simmers, add the cheese, a handful at a time, and stir to melt before adding the next handful. When the cheese sauce is smooth and creamy, add the mustard, vinegar and brandy. Season with a few grinds of black pepper. For dipping, move the fondue pot to its tabletop setup and serve with bread cubes, potatoes, sausages and pickles. When drinking good beer just isn’t enough.